SEPTEMBER 20 - 26, 2017 UCW 55 WWW.UPANDCOMINGWEEKLY.COM Best Plumbing Contractor Williams Plumbing Services, LLC (910) 488-4251 or www.willplumb4you.com Williams Plumbing Services, a great example of one Fayetteville family serving its commu- nity, has over 18 years of plumbing experience to offer. And as a family business that began in 2008, it knows what this community needs. The company believes in good work for a fair price. 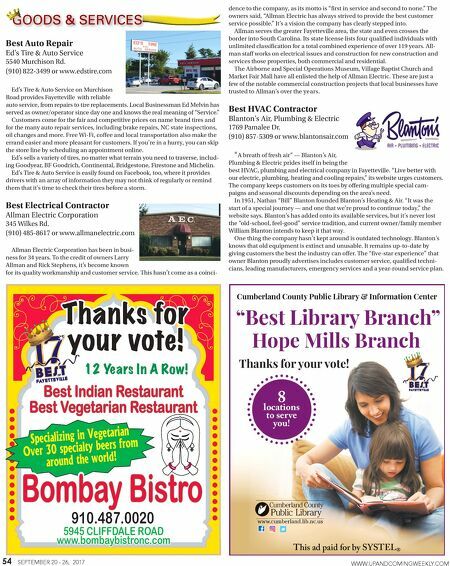 This has won Williams Plumbing many jobs from private, residential contrac- tors and from larger, commercial contractors. To streamline the financial process, it works directly with multiple home warranty companies and independent property managers. And it provides free estimates on city water connections, plumbing repairs and full-time estimators for construction needs. Raeford Knight, a customer and Facebook user, reviewed Williams Plumb- ing and thanked the company for helping during her "mini crisis." She said, "I called after hours and my issues was fixed in no time … I am a repeat customer for life." As an added bonus, Williams Plumbing offers discounts for active duty and retired military, senior citizens and teachers in the area. 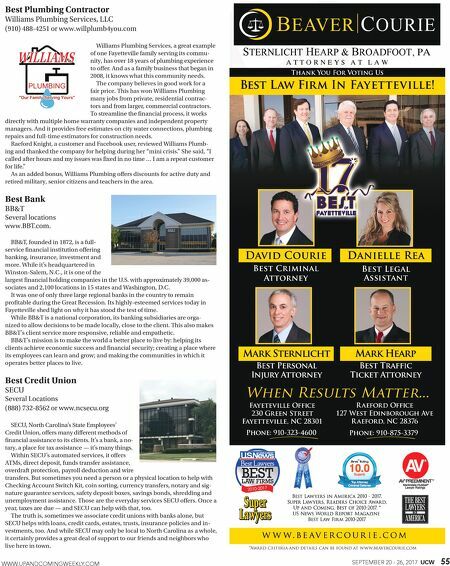 Best Bank BB&T Several locations www.BBT.com. BB&T, founded in 1872, is a full- service financial institution offering banking, insurance, investment and more. While it's headquartered in Winston-Salem, N.C., it is one of the largest financial holding companies in the U.S. with approximately 39,000 as- sociates and 2,100 locations in 15 states and Washington, D.C. It was one of only three large regional banks in the country to remain profitable during the Great Recession. Its highly-esteemed services today in Fayetteville shed light on why it has stood the test of time. While BB&T is a national corporation, its banking subsidiaries are orga- nized to allow decisions to be made locally, close to the client. This also makes BB&T's client service more responsive, reliable and empathetic. BB&T's mission is to make the world a better place to live by: helping its clients achieve economic success and financial security; creating a place where its employees can learn and grow; and making the communities in which it operates better places to live. Best Credit Union SECU Several Locations (888) 732-8562 or www.ncsecu.org SECU, North Carolina's State Employees' Credit Union, offers many different methods of financial assistance to its clients. It's a bank, a no- tary, a place for tax assistance — it's many things. Within SECU's automated services, it offers ATMs, direct deposit, funds transfer assistance, overdraft protection, payroll deduction and wire transfers. But sometimes you need a person or a physical location to help with Checking Account Switch Kit, coin sorting, currency transfers, notary and sig- nature guarantee services, safety deposit boxes, savings bonds, shredding and unemployment assistance. Those are the everyday services SECU offers. Once a year, taxes are due — and SECU can help with that, too. The truth is, sometimes we associate credit unions with banks alone, but SECU helps with loans, credit cards, estates, trusts, insurance policies and in- vestments, too. And while SECU may only be local to North Carolina as a whole, it certainly provides a great deal of support to our friends and neighbors who live here in town.